For whatever reason, NBC decided not to air Star Trek’s second pilot as the series’ premiere. Instead, they ran this solid whodunit (the sixth show produced) which dropped us right on board the U.S.S. Enterprise and let us fend for ourselves. 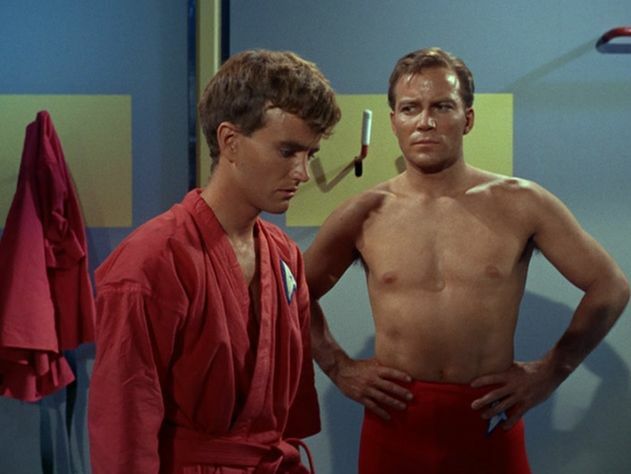 The Story: Captain James T. Kirk (William Shatner), his medical officer Leonard “Bones” McCoy (DeForest Kelley) and Crewman Darnell (uh-oh) beam to M-113 for a routine medical inspection of professor Robert Crater and his wife Nancy — who, incidentally, was once romantically involved with McCoy. 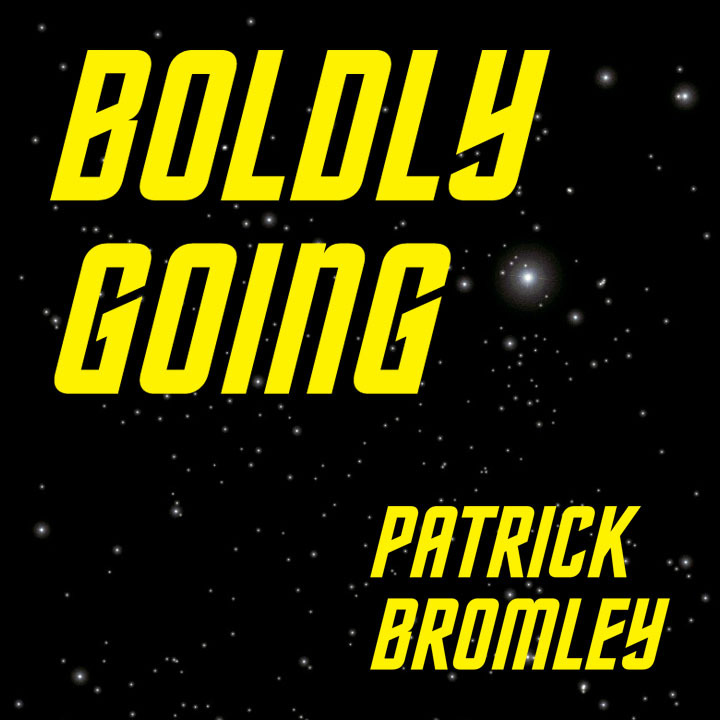 Before the inspection can even begin, a strange thing happens: McCoy sees Nancy just as she was when they were dating, while Kirk sees her as considerably older and Crewman Darnell (uh-oh) sees her as a different woman entirely. It’s not long before Darnell is being lured away by Nancy Crater (uh-oh); shortly after that, he’s mysteriously found dead (there it is), drained of all the salt in his body. So what does Kirk do? Beam more crewmen down to the planet’s surface (uh-oh uh-oh uh-oh). Sure enough, they’re drained of salt and killed by Nancy, too — allowing “Nancy” to take the shape of crewman Green and get on board the Enterprise. Once there, she shifts shapes like a mad woman/alien; it turns out “Nancy” is actually an alien that needs salt to survive, and she’s been draining the salt out of the crew. Taking advantage of McCoy’s residual affection for Nancy Crater, the alien knocks him out (with sleeping pills that he willfully ingests, so there’s that) and takes his place. It all leads up to a climactic confrontation between Kirk, Spock, McCoy and the Nancy alien, with McCoy having to make a choice between the woman he once loved and his friends aboard the Enterprise. Reflections from a First Timer: Even though “The Man Trap” plays a little more like a mystery than parable, it’s still a hugely entertaining outing. The characters are almost immediately defined, each getting his or her moment to shine. In particular, I really liked the little flirtatious banter between Uhura (that Nichelle Nichols was a FOX) and Spock; you can see where the writers of the 2009 Star Trek took their inspiration and ran with it. It makes sense to me that Uhura would be into Spock, though — she’s so hip and so cool that average crewmen about the Enterprise must be boring to her. She’s an original in search of an original, and they don’t come more original than Spock. It’s Kirk and McCoy who really get to shine in “The Man Trap,” though. 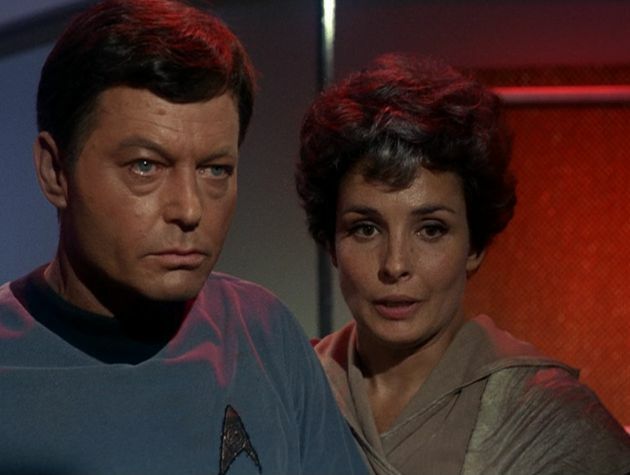 The dynamic of their long-lasting friendship is instantly understood; I particularly liked the moment where Kirk tries to gently break the news that no, Nancy Crater doesn’t look the exact same as when she and McCoy were dating. It’s a funny, warm moment with Kirk trying to let his friend down easily while still being a cocky sonovuabitch. It’s why Kirk is awesome. And though a lot of the show is devoted to the “murder mystery” aspect (not a great mystery, as we’re let in right away as to who is committing the murders), there are some nice touches. I like Bones’ refusal to let go of the past, and the way his and Kirk’s contrasting approaches bring them to blows. I like that there’s almost a sympathetic understanding of the alien — at one point, her husband as much as says “She’s just trying to survive.” He stays with her (it’s not “her” any longer, obviously) even after he knows what she is, and it ultimately leads to his own death. Something about knowing I was a scorpion? This second episode of Star Trek broadcast was the eighth produced. I didn’t enjoy it as much as either “The Man Trap” or “The Cage,” but I’m so enamored with the series right now that just the sounds about the Enterprise make me happy. It’s a real forest/trees thing happening these days, meaning I’m enjoying less impressive episodes more than I probably ought to. The Story: The crew of the ship Antares anxiously leaves Kirk and the Enterprise in charge of a young boy named Charlie (Robert Walker, Jr.), who was the sole survivor of a crash 14 years earlier and has been stranded all alone on the planet ever since. Once aboard the Enterprise, the crew has to quickly adjust to Charlie’s oddness — he has never interacted with people and doesn’t know how. He’s never even seen a girl, though he takes a particular liking to Yeoman Janice Rand (Grace Lee Whitney). There’s something even stranger about Charlie, though. He possesses some kind of mental gift that allows him to control anything he wants, making things disappear and generally altering reality. Being something of a whiny brat, Charlie’s all to quick to use the power to turn crew members into lizards, make them lose their voices and ultimately banish them from existence altogether. It’s eventually revealed that it was Charlie who killed the crew and caused the crash that stranded him on the planet Thasus for years. As Kirk tries to restrain the boy and get him off the Enterprise, Charlie only grows more and more angry and causes greater havoc onboard the ship. Eventually, a Thasian commander appears to Kirk and the Enterprise and says that Charlie was given his powers so that he could survive on Thasus, but that he’s not fit to live among humans and should be returned. Charlie, desperate and afraid, begs Kirk to let him stay on the Enterprise, promising not to use his powers anymore and reversing the damage he had caused. Kirk eventually relents, telling the Thasian commander that he would be willing to keep Charlie onboard, but it doesn’t matter — the Thasians take Charlie back anyway. Reflections from a First Timer: I can’t quite put my finger on why I don’t like “Charlie X” as much as the previous two shows. I think it has something to do with the heavy focus on Charlie, a character that pretty quickly becomes repetitive; I’d have much rather spent more time with the crew of the Enterprise. Scene after scene, we see Charlie throw a tantrum when he doesn’t get his way and take it out on the crew — particularly Yeoman Rand (who, if she ever shows up in any of the J.J. Abrams reboot films, really needs to be played by Mary-Lynn Rajskub). The whole thing was very reminiscent of “It’s a Good Life,” the Twilight Zone episode that inspired Joe Dante’s segment in Twilight Zone: The Movie, including the show’s creepiest moment, when Charlie demands a crew member stop laughing and she then appears with no face — much like the girl with no mouth in Dante’s Twilight Zone segment. That really, really freaked me out as a kid. In an amusing piece of ’60s goofiness, Uhura performs an entire song on the bridge of the Enterprise, accompanied by Spock on the lyre (that is, until it pisses Charlie off that she’s getting all the attention so he takes her voice away; what a telekinetic a-hole, right?). Maybe there are moments like this later on in the series, but right now it feels like an anomaly; for a show set in the distant future, the scene felt very much of its time. Luckily, the payoff of the episode redeems most of my disappointment. I like that Kirk is forced to quickly make difficult decision, and that he chooses the tougher of the options. I like how after an entire show’s worth of being whiny and largely despicable, Charlie becomes utterly sympathetic when he starts pleading to stay aboard the ship. It’s moments like this — grey areas of morality and an unwavering desire to do the right thing — that are already showing Star Trek to be a series way ahead of its time. Most shows on TV now are less dramatically and thematically dense. Oh, and here’s an observation: In the hall talking to Charlie, Kirk’s changes into his yellow captain’s shirt; two seconds later on the bridge, he’s back in the green tunic thing. Did he change on the way? Was that his hallway shirt? Enterprise Casualties: None. Everyone that Charlie vanishes is restored by the end of the episode. Badass Kirk Moment: Shirtless tutorial. I’m also not sure the logic (ha) behind the decision to not air the second pilot first. When it comes up a few episodes later in the viewing order it doesn’t seem as polished. I dug both of these episodes though these are not in my top 5 episodes. Patrick, I think your analysis is dead on as usual. -The creature in The Man Trap is lovingly called “The Incredible Salt Vampire” and has been a fan favorite for a while. -McCoy’s medical scanner in The Man Trap is actually a salt/pepper shaker! -The actor that played Charlie refused to come out of his dressing room or interact with the rest of cast except when filming his scenes. He did this to get into the roll and believed that Charlie should be anti-social and act strangely to other humans! -This the only episode of Star Trek where Roddenberry does anything in front of the camera. He is the voice of the chef. You don’t see him but you can hear him! What is a bit of a bummer is that in the remastered editions they released in 2007 they updated the graphics. I had these on VHS back in the day with the original graphics and the Enterprise in Charlie X actually looked a bit different than the classic design we know and love. At this point I think they were still trying to standardize things. At this point the Enterprise has been referred to as an American Vessel (The Cage), an Earth Ship, a United Earth Ship and a couple others. Looks like the United Federation of Planets doesn’t exist in Roddenberry’s head at this point.